(8470.14, Grant Foreman Collection, OHS). (11348, Industrial Development and Parks Commission Collection, OHS). The history of the Chickasaw Nation in Oklahoma began in 1818 when tribal leaders signed the Treaty of Old Town, ceding their lands in western Kentucky and Tennessee. Despite their refusal to cede their traditional lands in 1826, the election of Pres. Andrew Jackson in 1828, the Indian Removal Act of 1830, and the extension of Mississippi state laws over the Chickasaw foreshadowed their removal. The subsequent removal Treaty of Franklin of 1830 went unratified by Congress because the U.S. government could not guarantee a suitable land exchange west of the Mississippi. By the Treaty of Pontotoc in 1832 Jackson's treaty commissioners agreed to survey and sell the tribe's Mississippi and Alabama homelands, about six million acres, for $3 million. When Congress failed to ratify this treaty, Chickasaw leaders agreed to confirm their land-for-money exchange by signing the Treaty of Washington in 1834. After the Chickasaw failed to reach an agreement to purchase Choctaw land in the Indian Territory, Jackson's administration struggled to negotiate the Chickasaw removal from Mississippi. Due to intense pressure the Chickasaw and Choctaw signed the Treaty of Doaksville in 1837, which gave the Chickasaw the right to settle in the western part of the Choctaw lands in present southeast Oklahoma. Instead of purchasing the land, Chickasaw leaders agreed to lease the Choctaw tract for $530,000 and representation on the Choctaw Council. Approximately 80 percent of the preremoval Chickasaw population (4,914 and 1,156 slaves) completed their removal in 1837–38 without the privations and losses encountered by the Choctaw. However, they faced the loss of national identity and external threats. 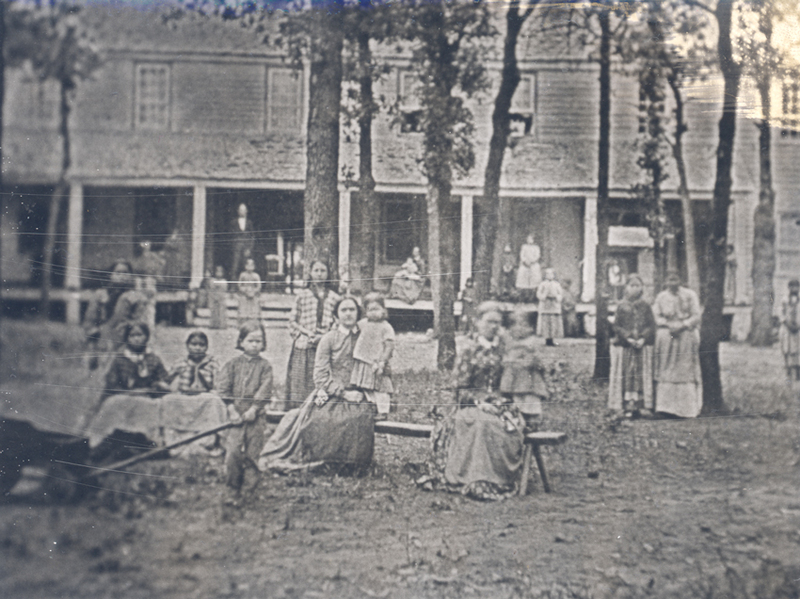 Instead of settling in the new Chickasaw District of the Choctaw Nation, the majority of the immigrants remained in temporary camps near Choctaw towns and government supply depots, drawing rations and waiting for annuity payments. Intemperance and a break down in political leadership and structure added to the malaise. Fear of attacks from the western tribes, especially the Kiowa, Comanche, and Pawnee, also slowed Chickasaw settlement on their land in the central and western areas of the Choctaw country. Despite the security afforded by the construction of Fort Washita in 1842 and Fort Arbuckle in 1851, the transition to the Chickasaw lands took fifteen years. Outvoted on the Choctaw Council and frustrated at their loss of identity as a people, the Chickasaw struggled to develop a new political order and to terminate their compact with the Choctaw. In keeping with the terms of the 1837 treaty, under the Choctaw national government the Chickasaw elected a district chief who served on the Choctaw Council, but they also continued their ancient system of a king and a clan-based council. In 1849 the Chickasaw District council set up a Committee of Vigilance to manage the tribe's external affairs. The members visited Washington to study legislation, scrutinize government management of the Chickasaw national fund, and press for the sale of their remaining land in Mississippi. Chickasaw leaders began to experiment with constitutional government and drew up a document at a general council at Boiling Springs in 1846. A second and more detailed document was written in 1848 and was amended in 1849 and again in 1851. As they refined their constitution, the Chickasaw campaigned to separate from the Choctaw and received support from federal officials. In 1854 Chickasaw and Choctaw commissioners reached an agreement. A formal separation treaty was finalized in Washington in 1855 and was ratified by both tribal councils and the U.S. Senate in 1856. The new Chickasaw Nation emerged in August 1856 at Tishomingo at a convention that ratified a new constitution. While guaranteeing the essential principles and the individual rights of a free people and government, the constitution provided for the separation of powers through three branches of government. The traditional tribal chief became the Chickasaw Nation's governor, elected by popular vote for a two-year term. The council became a bicameral legislative body, including a house of representatives and a senate. The judiciary included a supreme court, circuit courts, and county courts. The structure for local county government was defined, and slavery was protected. When Cyrus Harris, a mixed-blood, became the first governor of the new Chickasaw Nation, it appeared to signal a renewal and rebirth of his people. Mixed-bloods dominated the new government; as slaveholders and commercial farmers they dominated the economic resurgence prior to 1861. Cotton, corn, and other grains became the principal crops, but Chickasaw farmers also used their prairie lands for stock raising, including horses, cattle, sheep, hogs, and goats. Already famous for breeding horses, they established markets for their horses and cattle in Arkansas, Missouri, and Louisiana. With the eruption of armed sectional conflict, the Chickasaw Nation declared its independence in May 1861 and formally joined the Confederacy in July. Slave-owning mixed-bloods and individuals harboring bitterness toward the U.S. government over land sales caused the Chickasaw to ally with the secessionist South. The war proved to be costly. Chickasaws who raised fighting units had their lands invaded by thousands of refugees from neighboring tribes. The war formally ended for the Chickasaw and their neighbors at a meeting with federal officials in September 1865 at Fort Smith, Arkansas. Summoned to Washington in April 1866, the Chickasaw and Choctaw were forced to sign a treaty renewing their compact with the U.S. government. They agreed to abolish slavery, recognize the rights of freedmen, and provide railroad rights-of-way through their country. 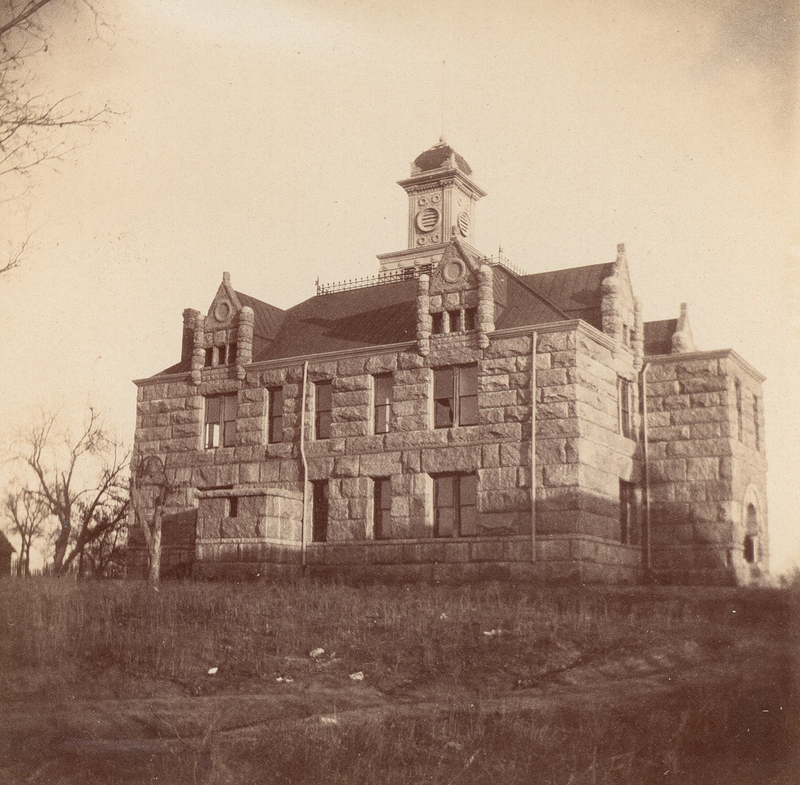 The post–Civil War era brought more challenges and threats to the Chickasaw Nation. The 1856 constitution differed little from the new constitution of 1866, which eliminated slavery and recognized the freedmen. Chickasaw economic and political life came increasingly under the influence of the U.S. economy, cattle ranchers, railroads, and white immigrants. Political infighting emerged between the National and Progressive parties. While the Progressives favored economic growth and accommodation, the conservative National Party dominated the government from 1874 through 1902, opposing allotment and territorialism. Nevertheless, the ranchers, the railroads, and an influx of American settlers that numbered forty thousand by 1893 undercut the conservatives' policies. Their greatest successes came with the reopening of schools and increasing educational opportunities for Chickasaw citizens, including the return of missionaries and church-supported schools. The Curtis Act of 1898 and the flood of non-Indian settlers forced the Chickasaw and other Indian nations to consider allotment and to agree to terminate independent governments. In 1895 the Dawes Commission began holding hearings in the Indian Territory to negotiate allotment agreements with the Five Tribes. Although a joint Chickasaw and Choctaw commission agreed to land allotment to tribe members and to reserve coal and asphalt lands, Chickasaw voters rejected the Atoka Agreement of 1897. Subsequently, Congress adopted the Curtis Act, which embodied the Atoka Agreement, ended tribal sovereignty, abolished tribal courts and enforcement of tribal laws, and scheduled all tribal governments to terminate on March 4, 1906. Faced with the dissolution of their tribal autonomy, the Chickasaw joined the other Five Tribes in a separate statehood movement for the Indian Territory. At the Sequoyah Convention, held in Muskogee in August 1905, delegates adopted a constitution and a plan for an Indian state. Despite receiving a resounding endorsement from a referendum of the Five Tribes, the U.S. government rejected their petition for statehood. By 1910 land allotments had been made to 6,337 Chickasaw and 4,607 black freedmen. In 1907 the Chickasaw became a powerless minority in their old tribal lands and in the new state of Oklahoma. Although the Chickasaw Nation ceased to exist from 1907 through 1983, the office of governor continued through presidential appointment. Chickasaw governors and tribal attorneys became involved with issues related to the jointly owned coal and asphalt lands and with other unresolved land questions. New Deal legislation of the 1930s, World War II, and the postwar period brought changes to the lives of the Chickasaw, including funds for education, relief, and jobs, election of tribal councils, and a renewed sense of Indian identity. A shift in federal Indian policy from termination to self-determination, pan-Indian activism of the 1960s, and federal War on Poverty programs spurred a political and cultural rebirth among the Chickasaw. In 1963 under the leadership of Gov. Overton James, the Chickasaw began to take advantage of federal programs to provide social and economic services to tribe members. In 1971 James became the first elected governor since 1904 under the Indian Civil Rights Act of 1968 and other federal legislation that restored the right to hold popular elections. The Chickasaw Nation adopted a new constitution in 1979 based on the old 1866 constitution and the U.S. Constitution with the separation of powers into the three branches of government. After several legal challenges, Chickasaw tribe members ratified a modified version that received approval from the U.S. government in 1983. After the election of Gov. Bill Anoatubby in 1987, the Chickasaw Nation entered the twenty-first century as a successful economic and political entity. From its tribal headquarters in Ada, Oklahoma, the nation had expanded its tribal enterprise programs and provided employment opportunities to tribe and non-tribe members throughout the United States. Gaming revenues were used to establish or expand business ventures, including tobacco shops, travel plazas, a publishing company, and an electrical utility. The Chickasaw population reached approximately thirty-seven thousand with some twenty-six thousand resident in Oklahoma. Those tribe members received a wide range of services, including family assistance, housing, health care, and education and training. Heritage preservation and the study of Chickasaw language, culture, and history remained a primary focus of tribal leaders. The Chickasaw Nation had achieved political and economic stability that boded well for the future of its people. Duane Champagne, Social Order and Political Change: Constitutional Governments Among the Cherokee, the Choctaw, the Chickasaw, and the Creek (Stanford, Calif.: Stanford University Press, 1992). Grant Foreman, Indian Removal: The Emigration of the Five Civilized Tribes of Indians (Norman: University of Oklahoma Press, 1932). Arrell M. Gibson, The Chickasaws (Norman: University of Oklahoma Press, 1971). Ethan A. Hitchcock, A Traveler in Indian Territory: The Journal of Ethan Allen Hitchcock, ed. Grant Foreman (Cedar Rapids, Iowa: Torch Press, 1930). James P. Pate, "Chickasaw," The Encyclopedia of Oklahoma History and Culture, https://www.okhistory.org/publications/enc/entry.php?entry=CH033.